Some information about the canalside development that CDC would like to implement. After various reports and looking back through old documents, canalside has been proposed from at least 2004 and even as far back as 1996. It is planned to housing, retail and commercial use. Why’s it on here…what’s the impact going to be on Southam road? Which in turn will impact Dukes Meadow Drive. On Thursday 16th of May, you are tasked with making a critical decision with very serious implications for the residents of Hanwell Fields, Hanwell Village and quite possibly Wroxton and Drayton. You are considering Application 12/01789/OUT. We are vehemently opposed to Planning Permission being granted to the Developers on the following grounds. We challenge the need for these houses. We have produced a set of figures which has been passed to the Council, which show a much smaller number of houses needed for the Council to meet its housing provision obligations. The Council has produced its figures using the old South East Plan, which is now superseded by the National Planning Policy Framework. The NPPF requires housing provision to be made on fact based assessment - this figure is now 10,080 houses (calculation based on ONS 2010 figures) and not 16,750 as currently published (old SE Plan). This means Banbury new figure = 3,326 and not 5,954 again as published. We consider any decision made to be premature in the absence of an adopted Local Plan. We are asking primarily for permission to be refused, but at the very least we would expect the decision to be deferred on grounds of "prematurity"
The Council-commissioned Landscape Sensitivity and Capacity Report clearly identifies this land as being the LEAST suitable of all the sites the Council has marked for development. Moreover, this report goes further and the recommendation for future Management and Maintenance advocates an ENHANCEMENT of the existing informal recreational uses. We are upset and angry that the results of the report will have been totally ignored if planning permission is granted. 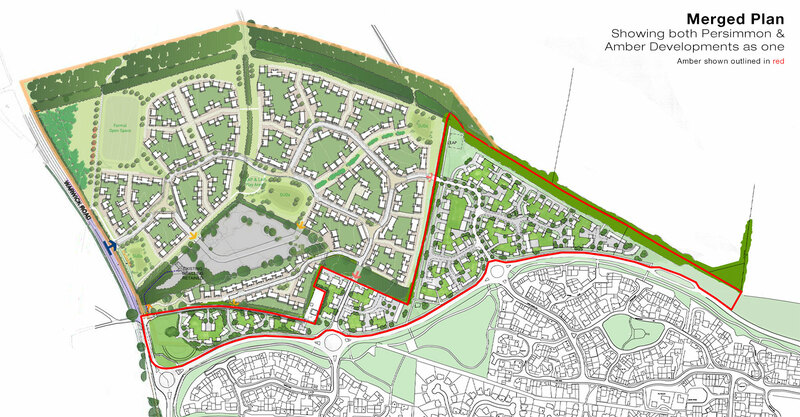 As part of the Design Brief for Hanwell Fields, the Council itself designated Dukes Meadow drive as the natural northern boundary of Banbury, in order to prevent "urban sprawl". solicitors conducting searches for potential house buyers on Hanwell Fields were given the assurance that the northern side of Dukes Meadow Drive would not be built upon. We do not believe that the Council has sufficient grounds on which to propose breaching this natural northern boundary. Salt Way is not considered by the Council as being suitable for development as it forms a natural southern boundary for Banbury. It is inequitable that the northern boundary be treated any differently. Salt Way was the subject of a Public Enquiry. We demand at least the same fairness applied to the residents of Hanwell Fields, Hanwell Village, Wroxton and Drayton. Planning Permission has already been granted to Bankside. This number of houses 1,090 delivers all of the Council's Housing Provision/Five Year supply and more (infact this one development would deliver 8.86 years - using our fact based figures). We know that the Planning Inspectorate have been advised by Ministers that in the case of any planning appeals, any unimplemented planning permissions should be taken into account. Therefore we ask the Council to take the common sense approach and refuse this Planning Application, unfettered by fear of the Planning Inspectorate. We have a meeting with the council at Hanwell Fields Community Centre (top floor) SATURDAY 11th @ 3pm. Please be there prompt. We have started to compile a list of alternative sites based on the recommendations of Tony Baldry, he said that we should seek these sites to remove focus on the areas to the North of Banbury. We are not particularly happy about doing this as it will only pass the issues to another area. However, that is what we are doing. 2 of these 3 sites are easily within walking distance of Saltway. There are shops and schools closer to this area. Both the North and the South of Banbury have 2 artillery roads connecting the site. North has Southam Road and Warwick Road, Whilst the South has Oxford Road and the Bloxham Road. All are major roadways in to Banbury. According to the local plan a further connecting road is to be built that will connect Bankside to Thorpe Road so this adds to the sustainability of Saltway. Some would say that Saltway needs to be protected as it’s an ancient walkway. BAN5 has 2. Our biggest concern is the biased views of the council and why they seem content on destroying the North of Banbury but not the South. Why have none the site been assessed on equal terms. If this were the case then Saltway and West of Warwick Road would both be on the Local Plan. As yet this council can not prove it has approached these site allocations in a fair, honest and open way. Slightly off topic I know, but I offered to spread the word for them. After all we are trying to make Hanwell Fields a better place to live. You can come and meet the local police team and tell them about issues that matter most to you (I wonder if they know anything about planning). Where and When….Wednesday 21st November – 7pm till 8.30pm, down at the shops by the purplemango, the pub, community centre. etc. etc.